How’d you spend your last week of summer? 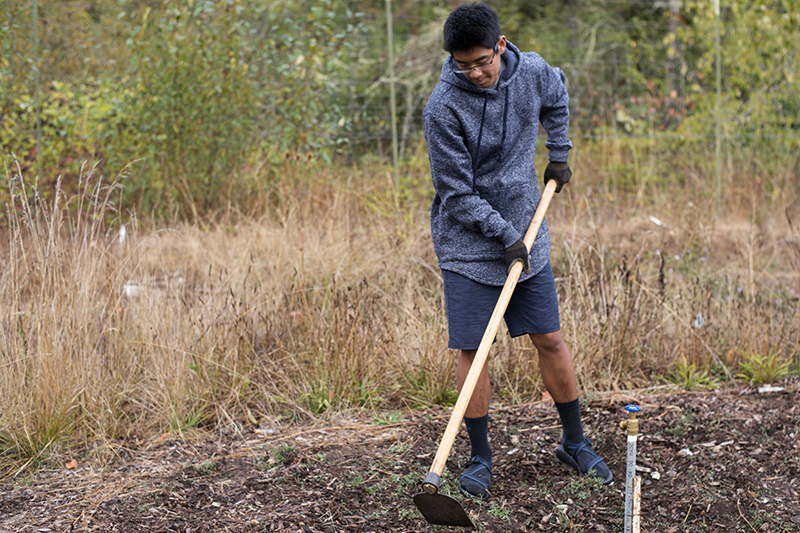 For these first-year Ducks, their transition to student life began with four days of riding bikes, visiting—and camping on—local farms, waking up with the roosters, and picking 1,000 pounds of tomatoes. 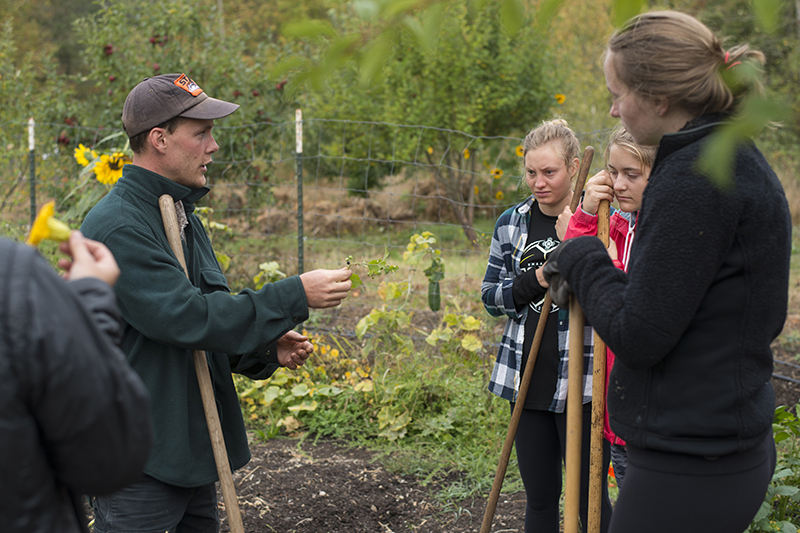 They learned—first-hand—all about local agriculture and sustainability. In addition to 90 gallons of pizza sauce, they all made some new friends. 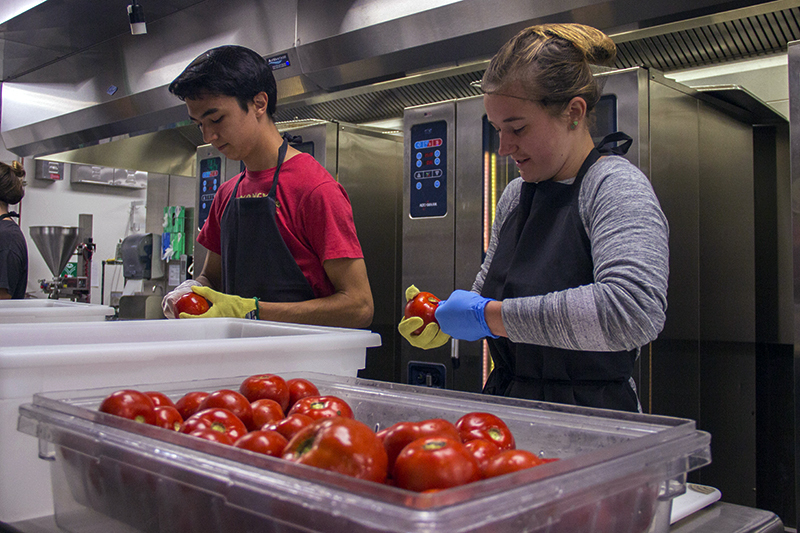 And you can taste the fruits of their labor when the pizzas are featured at University Housing's annual Farm-to-Fork Dinner, Thursday, October 27, in Carson Dining. How’d you spend your last week of summer? 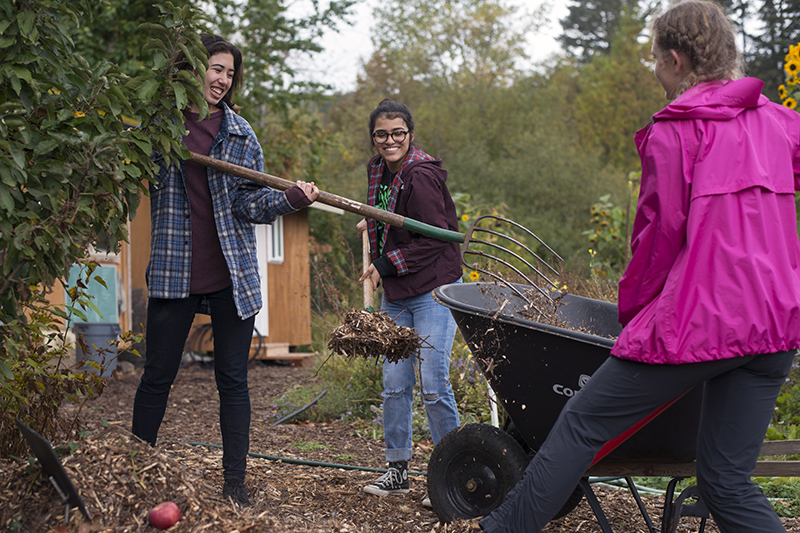 For these first-year Ducks, their transition to student life began with four days of riding bikes, visiting—and camping on—local farms, waking up with the roosters, and picking 1,000 pounds of tomatoes. They learned, first-hand, all about local agriculture and sustainability. In addition to 90 gallons of pizza sauce, they all made some new friends. 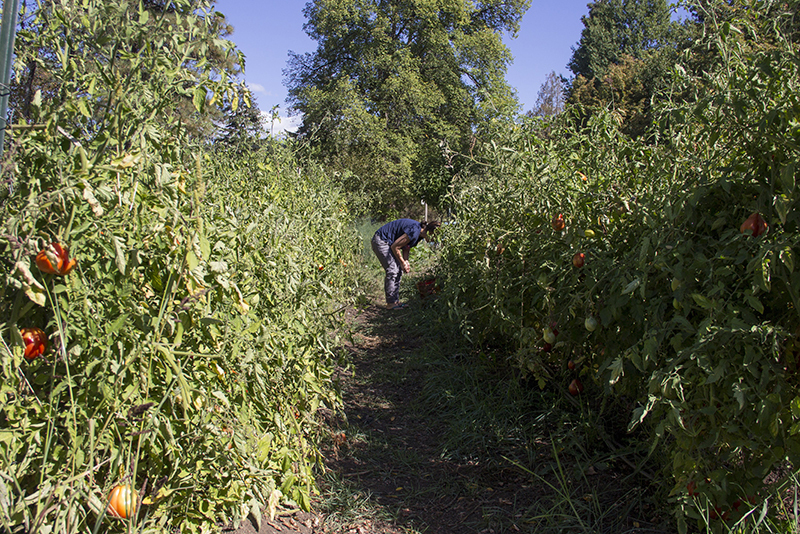 Project Tomato is one of five orientation programs for students in the Community for Ecological Leaders, an academic residential community. 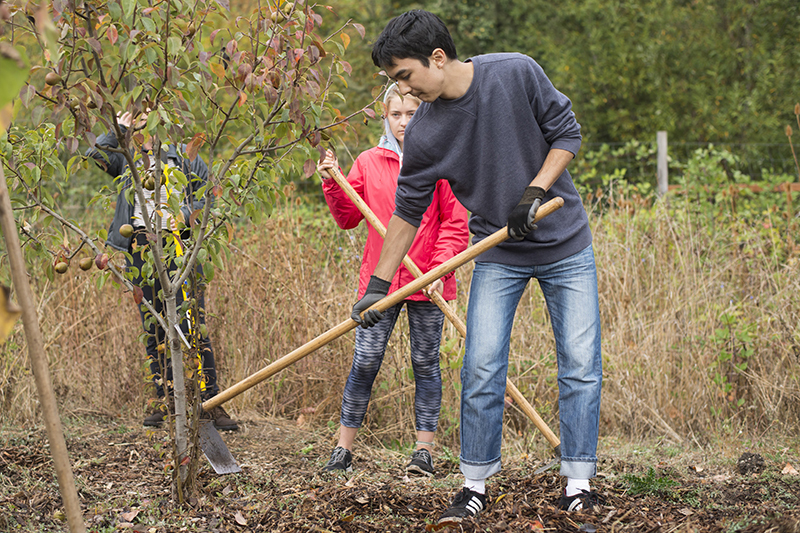 Students work on local farms, pick (and eat) produce, and explore the community with a focus on food. 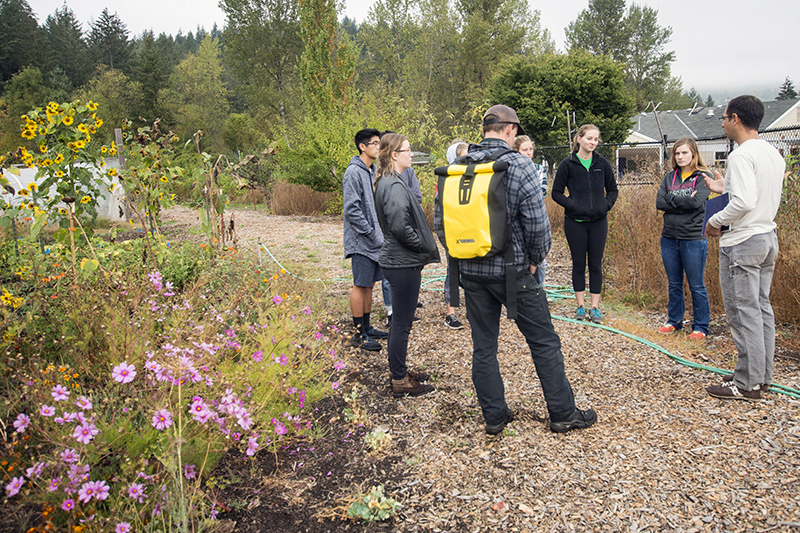 They learn about composting, fixing bike flats, local produce, edible weeds and flowers, free-range chickens, and ways to participate in sustainable agriculture. 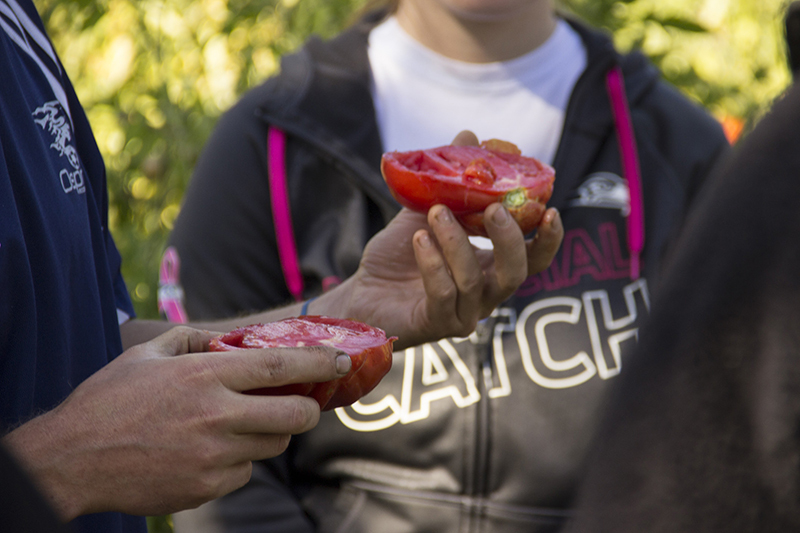 Project Tomato is one of five orientation programs for students in the Community for Ecological Leaders, an academic residential community. 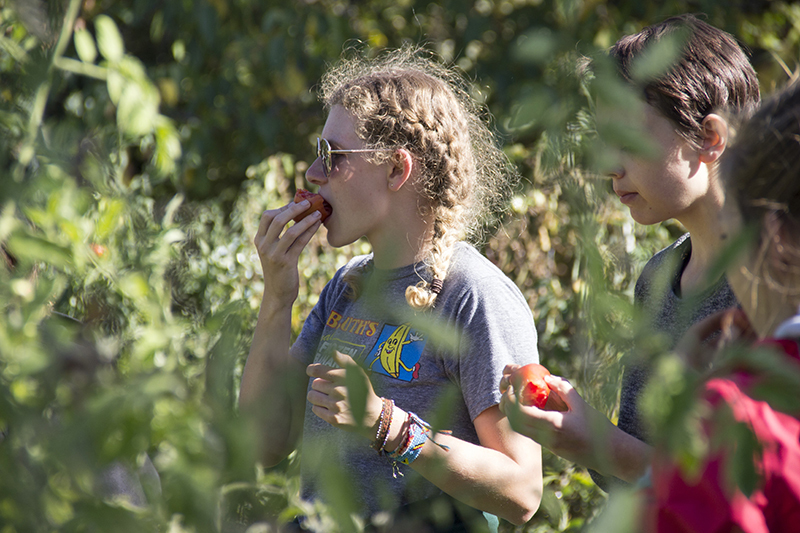 Students work on local farms, pick (and eat) produce, and explore the community with a focus on food. They learn about composting, fixing bike flats, local produce, edible weeds and flowers, free-range chickens and ways to participate in sustainable agriculture. Directions: Visit farm and pick tomatoes. Rinse and core, blanch in hot water, shock in cold water, peel and de-seed. 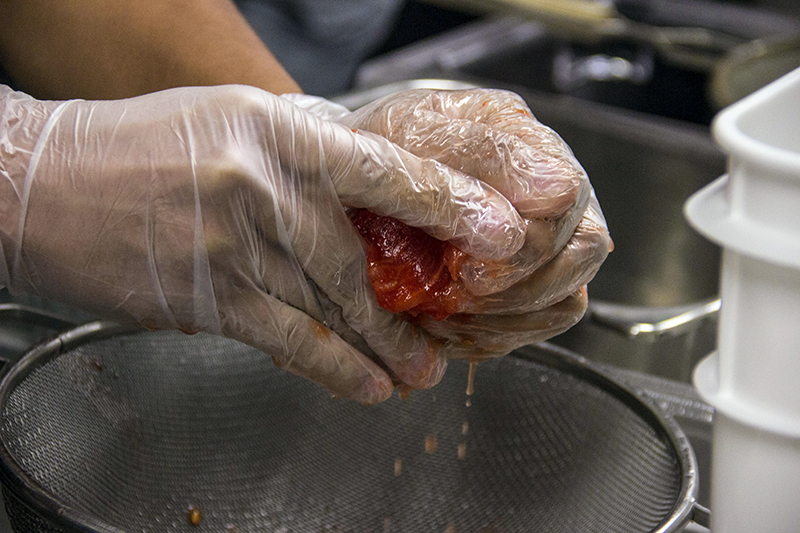 Add additional ingredients and puree. 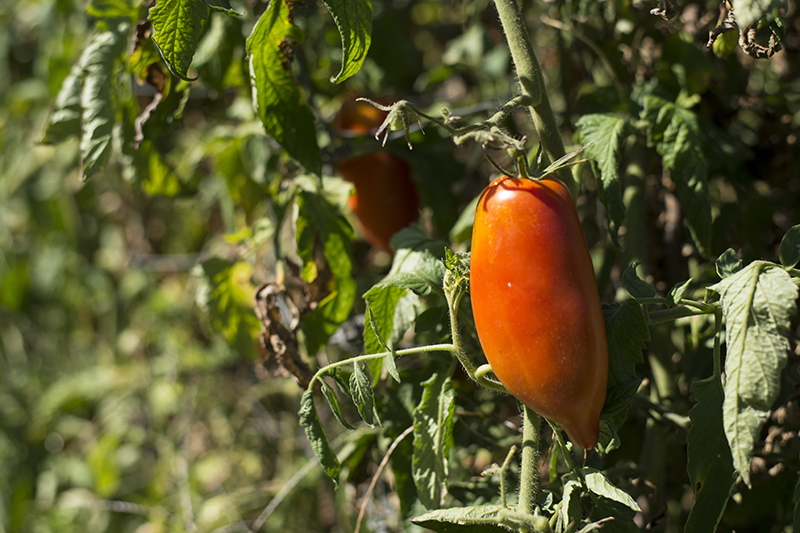 To make at home: Use 10 pounds freshly picked tomatoes, 1.5 tablespoons of both garlic and dry basil, two six-ounce cans tomato paste and two tablespoons kosher salt. Makes about a gallon. Freeze any leftovers. 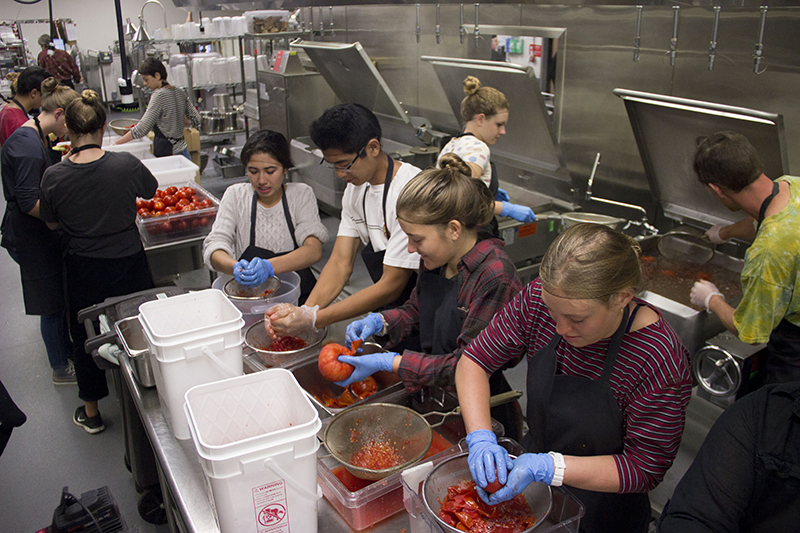 On Sauce Day, the culmination of Project Tomato, students transform 1,000 pounds of tomatoes they picked into 90 gallons of sauce—enough for 1,920 pizzas. 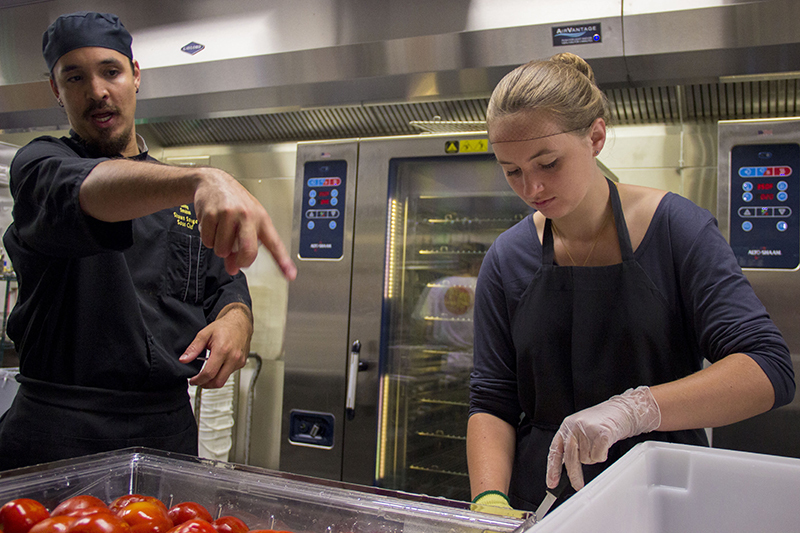 University Housing will feature the pizzas at their annual Farm-to-Fork Dinner, Thursday, October 27, in Carson Dining. Do you know what flowers and weeds are edible? The nutritional value of dandelion greens? Why ugly apples can be tastier and better for you (and the environment)? 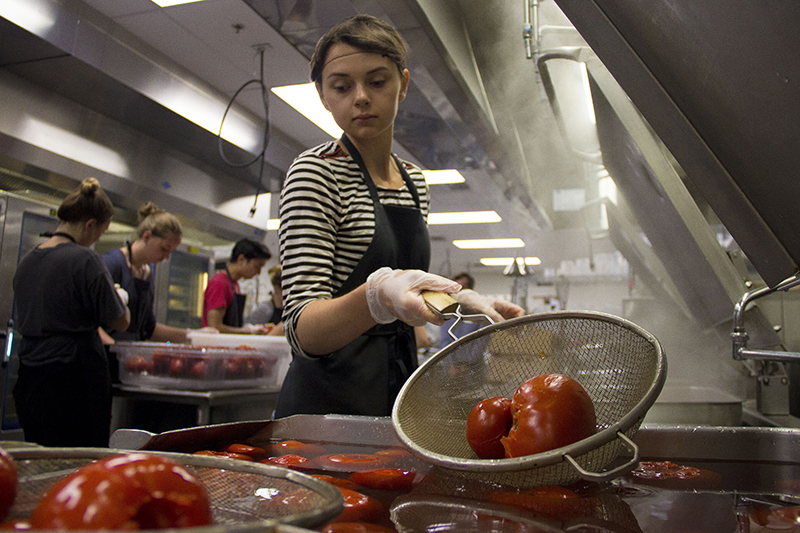 For Project Tomato students it’s farm-to-fork and garden-to-mouth. They sample fruits, veggies, smoked salmon, goat cheese and (so-called) weeds. And they make apple cider, pasta from free-range chicken eggs, and their own hand-foraged salads.